Earn up to 1,272 reward points. Get your tone howling with this vintage-style fuzz. 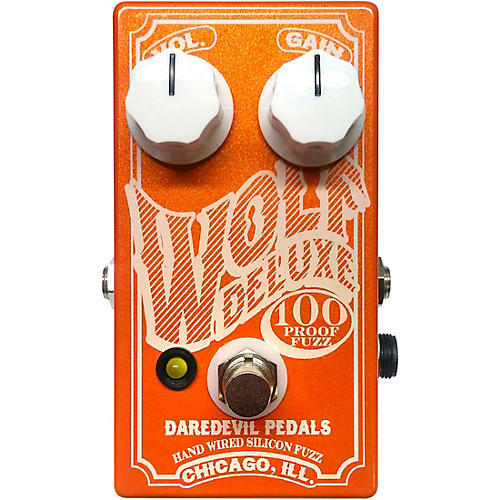 The Daredevil Pedals Wolf Deluxe fuzz is very warm, vintage and has loads of sustain. The unique aspect of the Wolf is its tonal character, slightly boxy, like a small vintage amp turned up all the way. You can get that great singing LP neck pickup tone while using your bridge pickup and retain the cut and output. Works great with P90s, single-coils, humbuckers, you name it. Backing off the gain gives you a little dirt and the cool tonality but the ability to clean up great. All hand-wired, true bypass.